Today’s devices are “smart.” Thanks to the Internet, we can connect to our home’s thermostat, TV or alarm system using a smartphone or tablet. Other devices monitor our heart rates or calories burned, sync with our smartphone or desktop, and then provide us with a wealth of data that we can use to better our health. This connectivity, between our smart devices and the Internet, is what’s referred to as the “Internet of Things.” But, smart devices aren’t limited to consumer goods. Manufacturers have also become “smart” in that recent innovations allow devices, machines and equipment to communicate seamlessly with each other in an automated factory network via Ethernet. This industrial connectivity is referred to as the Industrial Internet of Things (IIoT), a term coined by Richard Nass of Automation World. In Germany, some call it Industry 4.0. Using the Lanmark Controls LEC embedded board with the Remote API, laser marking systems are factory ready to network into the IIoT, allowing for the flow of two- way data communication with the laser marking system, central to the industrial connectivity necessary to simplify, track, and optimize processes. To help you learn more about the IIoT and “smart” laser marking, we’ve created the following resources. We hope you find it helpful. 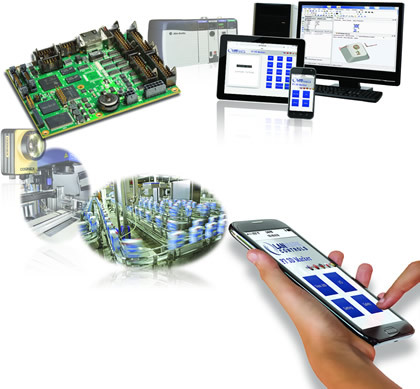 In this Industrial Laser Solutions article, Lanmark Controls VP of Sales and Marketing Chris Oskirko describes what is the Industrial Internet of Things and how the LEC boards make the automation of many manual tasks possible. Have questions about the IIoT or our LEC boards? Start here. Of course, if you have additional questions, especially with regard to how you can integrate smart laser marking into your factory or laser marking machines, please contact us. One of our engineers will be happy to speak to you. Be sure to follow us on Twitter where we’ll also post IIoT items of interest!